At the edge of the property, what we saw was astounding. We found a village of six adults, two teenage boys and a few children staying in stick-made huts surrounding a man-made fire. 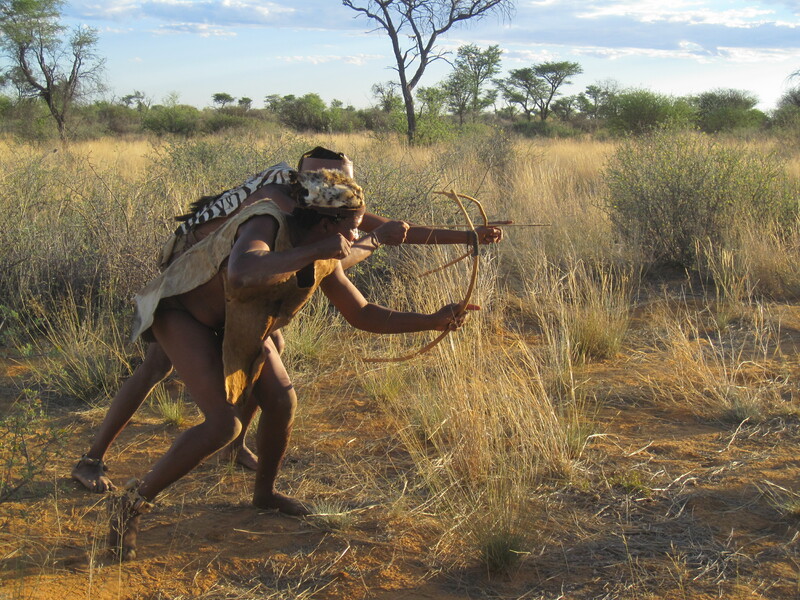 They wore little clothing, spoke their own language, used traditional methods of hunting, played with sticks, and regularly drank out of ostrich eggs. As Andrew translated our conversations and questions, the Bushmen demonstrated how they trapped animals, made a poison to place on the end of an arrow, created gorgeous shell jewelry out of ostrich eggs and altogether how they lived. 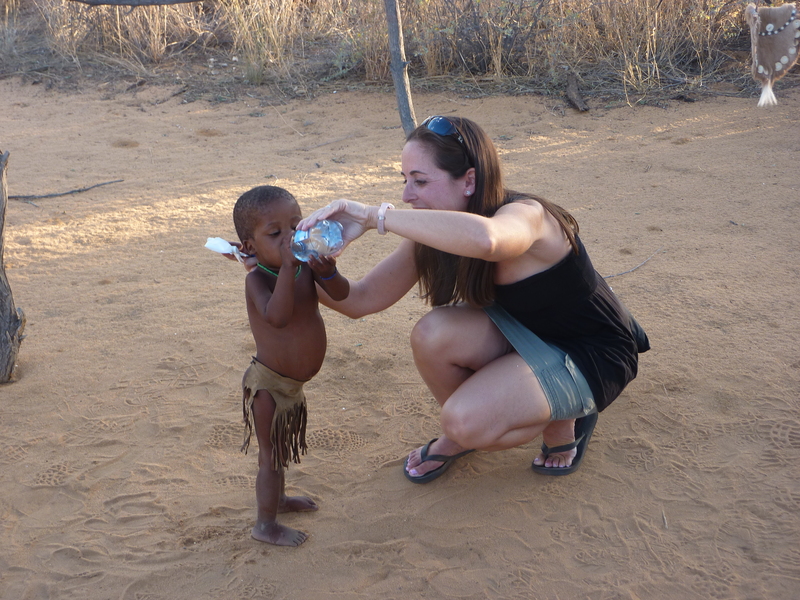 When a very young boy (less than two years old) started reaching for a water bottle, I knelt down to his level to give him mine. His eyes lit up and his smile reached his ears. For many of us, the sight of a water bottle rarely exhibits this type of reaction. How many of us walk through the local supermarket with eyes brighter than the stars at the sight of a case of Poland Springs? My new little friend needed help lifting the bottle and as the water dribbled down onto his bare belly; both his smile and his belly grew bigger with every sip. His big brown eyes looked up at me as he drank and after I helped him wipe his belly of the extra water, he threw his little arms around my leg. Andrew said that the reason his little fingers had trouble with the bottle was that he was used to drinking out of the ostrich eggs. This small act triggered so much inside me. At that very moment I wished all people could experience something like this. So many talk about the simple things in life, but how many of us truly live that way? The bush people are nomads. When their tracking slows they pick up and move and set up shop in a new location in the hopes that their food will be readily available to catch. They live fully within their means and by their own code. They survive off of the land and material items are unnecessary. Their life is their family, their land, their stories and their instincts. That little boy has never seen Mickey Mouse in person or won an Olympic medal-yet his eyes were as big and his smile as wide from a stranger handing him a store-bought bottle of drinking water. Imagine what the world would be like if experiences meant as much as material things. How would the world be different if we all made some small adjustments in our lives to value each other, our survival and our stories more than our material possessions? How very much can we learn from the smile of that one little boy? After a sad attempt of mine to shoot an arrow and a purchase of a hand-made ostrich shell necklace, we said goodbye and returned on our raised mode of transport to the lodge for dinner. Tomorrow we would have to say goodbye to Namibia-a place I never knew I’d absolutely fall in love with and want to journey to again. It’s now so very easy to comprehend Angelina Jolie’s love for the Namibian people, their cultural ways and this gorgeous land of ocean, sand dunes & animals. I’ve learned so very much on this part of our journey-things you couldn’t learn in a book or on television; but, things you had to see and experience on your own, with your own eyes, and your own heart. 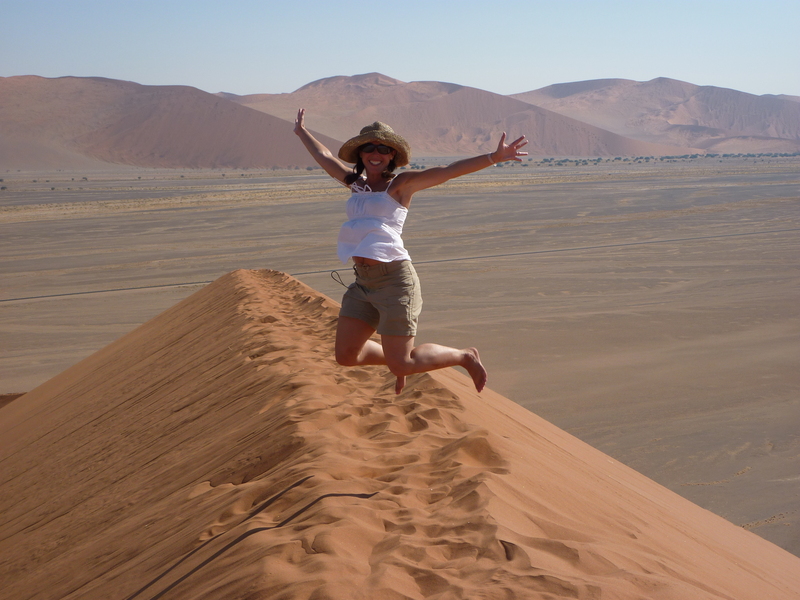 Namibia, its landscape and its people force you to look deep into your soul and rethink your world-view. Each person we’ve met here has been the most genuine. Properties are often kilometers apart, the nearest village or doctor could be hours away, fresh water is piped in and internet connections are scarce. Their land and way of life might be different to that of our own but its merit and benefits are beyond your wildest dreams. Everyone, regardless of situation, seems to truly enjoy his/her life to the fullest and not take any day for granted-a lesson not to be taken lightly. 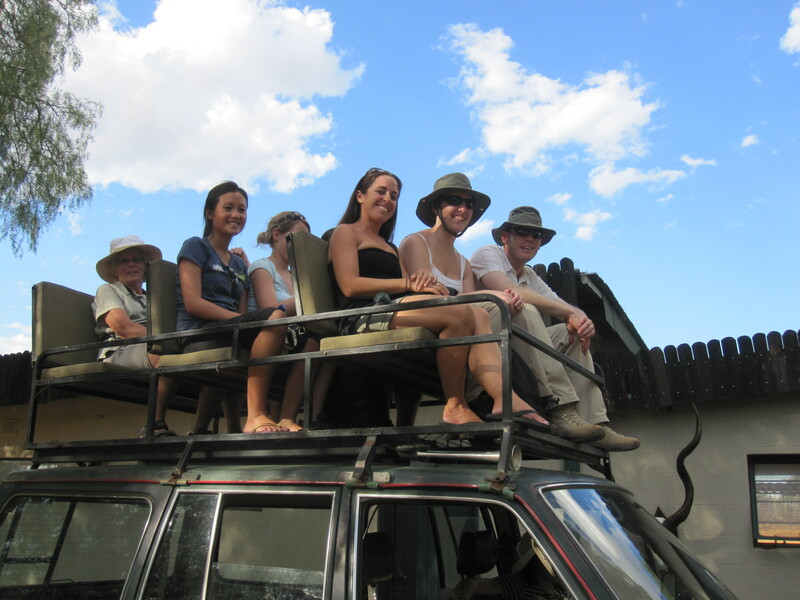 I will remember Namibia. There is so much peace and beauty here to experience. It gets into your soul and deep into your heart. This country and its people have shown me more in a few short days than any textbook could teach in a lifetime. Travel is perspective changing and is, as Mark Twain said ‘fatal to prejudice’. I will return to Namibia.